Hockey is becoming easier and more fun to watch as NHL and AHL arenas switch to LED lighting with dramatic effect. We all know ice shines white. But NHL and AHL teams have discovered that LED lighting makes ice even more dazzling. “(LED) makes everything brighter, the ice whiter and the colors pop out more,” Julien BriseBois, assistant general manager of the Tampa Bay Lightning, told SI.com. “It is easier to track the puck and easier to track it in the air.” That's true for fans sitting in mid-level seats as well as players digging it out of corners that are no longer shrouded in shadow. Mike Lorenz, president of Ephesus Lighting, told SI.com that LED provides digital lighting and the ability to control it at the point of its source. “You can direct it to exactly where you want to send it,” he says. The move to LED started in the AHL with the Syracuse Crunch (the Lightning’s top minor league affiliate) in 2012. The Oncenter War Memorial was the first arena in the U.S. to install it. 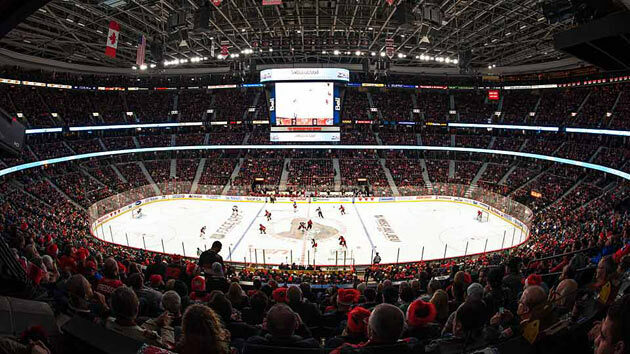 Now there are five NHL venues with LED lights—Ottawa’s Canadian Tire Centre (photos above and below), Montreal’s Bell Centre, Philadelphia’s Wells Fargo Center, Carolina’s PNC Arena, and the Staples Center in Los Angeles. BriseBois says the variety of benefits afforded by LED lighting have caused team and arena owners to look at it as a package. There’s gameplay benefit with pinpoint digital lighting, cost savings of running a more energy efficient system, and a heightened entertainment value. Traditional metal halide light is indirect and causes shadows. Digital lighting allows the playing surface to shine, giving better visibility from board to board, including the corners. The ability to program warmer or cooler light also allows colors to illuminate better, giving a more natural tone to everything from uniforms to logos. This proves important for venues that switch between basketball, hockey and concerts. That pinpoint ability remains part of the reason why LED lighting helps save money. LED lights emit less heat than traditional lighting—that’s important when it comes to keeping ice frozen—and can reduce wattage needs by about 75%, resulting in an 85 to 90% energy savings across the system, Lorenz says. The digital nature also allows for lighting that is designed specifically for an arena. Programmers can now direct less light to the seats while they illuminate the benches and ice more brightly. The lights can also be turned off and on instantly, creating an added entertainment value with special effects and flashes or by synchronizing them to music. Lorenz says that up to 10 NHL teams will evaluate making the switch to LED technology during this off-season. And he expects the same number next year. “In three to four years, you’ll find most of the professional venues are using LED technology to light arenas,” he says.